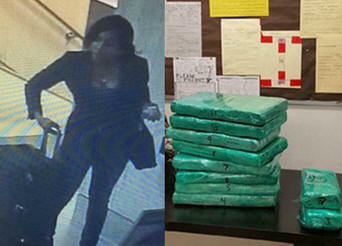 March 25, 2016 - JetBlue flight attendant, Marsha Gay Reynolds, 31, surrenders to New York authorities after feeing from a checkpoint at Los Angeles International Airport after dropping her suitcases containing nearly 70 pounds of cocaine worth close to $2 million. Last Friday evening, Reynolds was in line for passenger screening at terminal 4 when a TSA agent pulled her out of the line for a random check. Reynolds who was off duty at the time and wearing her crew member badge was escorted to a screening area where she was left unattended. Flight attendants and other crew members are not normally subjected to searches. While in the screening area, Reynolds reportedly made a cell phone call, she took off her Gucci high heel shoes and then bolted from the terminal and up the escalator. The Los Angeles Police Department was contacted for unattended bags. The bags were immediately inspected and found to contain 10 bags of cocaine wrapped in green saran wrap labeled “BIG Ranch” with a weight of 68.49 pounds. Sometime after the events, Reynolds was ale to use her airline identification to board a flight for JFK Airport, New York. Upon arriving at JKF, Reynolds went to her Queens apartment to gather some personal items and then got a room at a Hilton Hotel close to JFK Airport. On Wednesday, Reynolds who has worked for JetBlue for more than six years turned herself in with authorities at JFK airport. She was arrested by Drug Enforcement Administration agents and charged with possession of cocaine with intent to distribute. On Thursday in court, the prosecutor reported authorities are searching for an unidentified co-conspirator involved in the case, they don't believe this was the first time Reynolds smuggled drugs into an airport and that Reynolds "took advantage of her position as a crew member". Reynolds' attorney, Allan Jennings said in court "She may not have been fully aware of what was in the bags." The Brooklyn judge in this case granted Reynolds bond for $500,000. However, Reynolds would not be released until California weighed in on the case. In court, the judge warned Reynolds family and friends that when Reynolds is released on bail, if she flees they could lose their homes. Los Angeles Airport Peace Officers Association President, Marshall McClain said “The weekend’s incident reinforces the Los Angeles Airport Peace Officers' Association's calls for an airport police officer to be stationed within 300 feet of the TSA screening checkpoint." While airport police officers are charged with patrolling an entire massive airport terminal, having an officer dedicated to being within 300 feet of the security area ensures that an officer is immediately available to respond to issues at the screening station which is the last line of defense in keeping unwanted items off of planes and ill-willed individuals from getting access to planes. Further, screening all airport and airline employees, and the items they bring to the airport, is a feasible and practical solution to fortifying security at our nation’s airports. Just like traveling passengers, airport and airline employees should undergo the same.